The Peruvian Amazon lost nearly two million hectares (five million acres) of forest between 2001 and 2016, or more than 123,000 hectares (300,000 acres) a year, figures made public Tuesday by the ministry of the environment. Agriculture, livestock raising, illegal logging, clandestine mining and drug trafficking were the main culprits, Cesar Calmet, the head of the ministry's forest preservation program, told AFP. "Unless decisions are taken on the matter, forest loss could reach 300,000 to 400,000 hectares a year," he warned. Satellite images show that deforestation continued apace in 2017, with 143,000 hectares of Amazon forest wiped from the map of Peru, "the equivalent of 200,000 football fields," according to the environmental website Mongabay. Peru is one of 17 "mega diverse" countries on Earth, which together contain 70 percent of the world's biodiversity, according to the UN's environmental agency. It also is the country with the second largest expanse of Amazon forest after Brazil. Located in the country's east, the Amazon basin accounts for a third of Peru's territory, and is a precious resource for absorbing greenhouse gases, the cause of global warming. 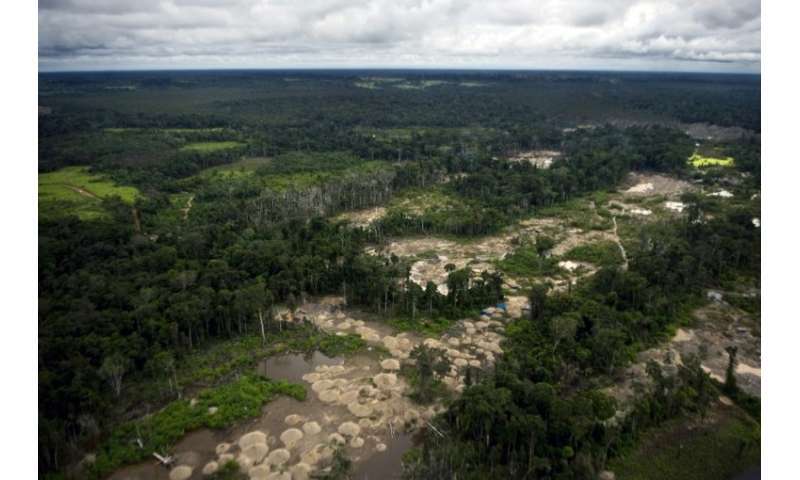 Calmet's group at the environment ministry says the situation is particularly troubling in the southern Amazon region of Madre de Dios where panning for gold is widespread and deforestation is advancing rapidly, from 5,000 hectares in 2001 to 17,000 in 2016. Pope Francis traveled to the region in January and called for protection of the Amazon and its indigenous inhabitants.